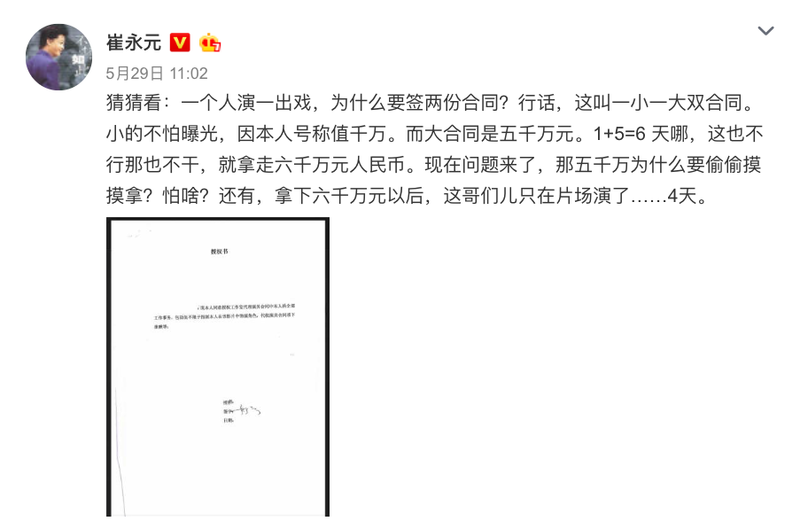 On May 28, TV host Cui Yongyuan wrote a post about a certain actress saying that she shouldn't act because she's really terrible. Along with his blatant insults were snapshots of a contract, which he continued to release over the next couple days. His expose basically accused Fan Bingbing of signing a yin yang contract and that she was paid an exorbitant amounts of 60 million for just four days of filming. In layman terms, yin yang contract means that she allegedly signed two contracts for one job, the official one with a smaller amount for tax purposes and the hidden one that has the real number. Cui Yongyuan's accusations caused quite a stir that it has gotten the tax man involved. 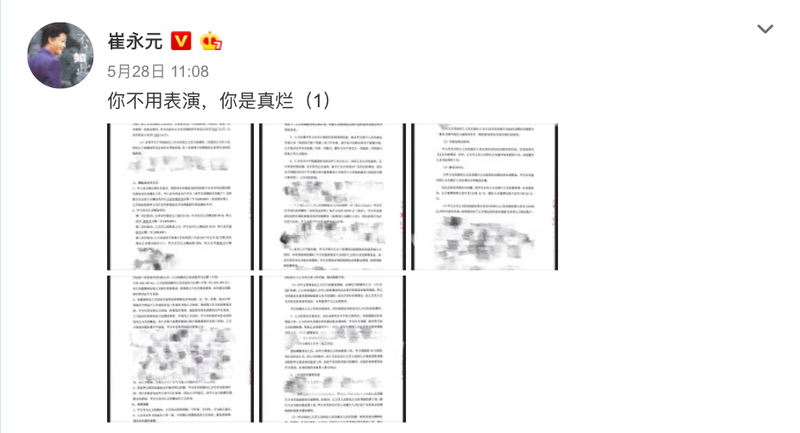 As recently as yesterday, June 3, the Wuxi tax department advised that they were following the requirements of the State Administration of Taxation and Jiangsu tax authorities to investigate the matter accordingly and that anyone found guilty will be punishable by law. 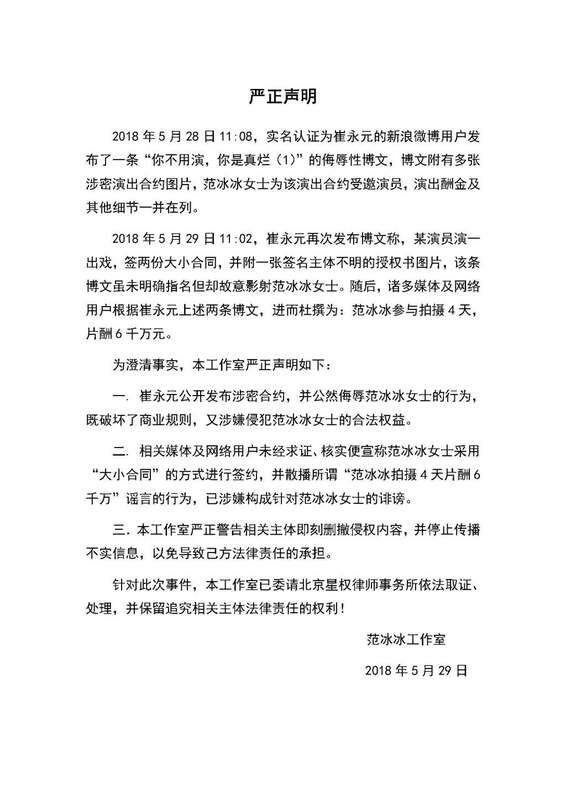 Given the gravity of the matter, Fan Bingbing studio immediately issued a statement against those spreading false rumors against her and accused them of libel especially Cui Yongyuan who violated business practices in disclosing an actress's contract. Her side also said that Fan Bingbing never signed a yin yang contract and that they will cooperate with authorities. Damn, someone's out there is trying to ruin her career. I thought his original comments were more of a criticism for getting so much money for so little time. And then a different person submitted allegations that she was committing tax fraud, which is now being investigated. While her contract did seem super excessive, she is a movie star and this is what they expect for their time. I also think that most celebs do use means to evade tax. Just like the really rich always find loopholes. The only people really suffering from taxes are people who are not rich enough to get through the loopholes or hire people to find them aka middle class and upper middle class. You are exactly right! Some rich people often find ways to cheat on taxes (no matter what fields they are in). That's one of the reasons why the rich, get richer. I'm very sure some other high earning celebrities are doing it also. Greed will make people do these things. Just look at the current president of U.S.A. He refused to disclose his taxes to the Americans people. If you don't have anything to hide then why hide it? To me it's not worth it because one will always have to watch her/his back. I don't want to live like that and that's why I'm poor. The sad thing is that most of these loopholes are legal. Shady but legal. Just remember the Panama papers. It came out that a lot of celebrities were doing it. Even the Queen of England. Also, all the big companies have their money offshore.